Discount Fence Co. offers four types of privacy slats for your chain link fence, plastic PVT slats, Wing slats, Hedge Slats and Aluminum Privacy slats. All four types are long lasting and very durable and are an ideal project for the do it yourselfer. Privacy screening also can enhance the look of any chain link fence. Any type would be a great way to add beauty and privacy to your chain link fence. 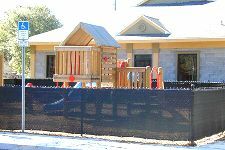 Plastic Vertical Tubing (PVT) slats are tubular plastic extrusions which are inserted into any type of chain link fencing to add beauty and privacy to both sides of the fence. Once installed, PVT slats are virtually maintenance free. Salt, sand and road dirt will not harm the slats in any way. Due to the UV inhibited thermo plastic design, PVT slats will not fade, chip or discolor for at least 15 years. The locking system is located near the top of the slats to ensure a clean, straight edge along the top of the fence. VANDAL PROOF - PVT slats have a unique locking feature. Once the horizontal locking strip is in place, the slats cannot be removed from the fence. PVT slats are sold in bundles enough to cover 10 linear feet in heights from 4' - 10' with the same color in each bundle. When you need increased privacy, our Wing Slats are the answer. With the proven quality and durability of our PVT slat plus unique "wings" for extra screening and security, these slats are self-locking - no channels are needed. Privacy plastic vertical inserts have a rigid flat tubular body with "legs" inside for extra support. Flexible and resilient wing portions are positioned on each side of the slat body. Serrations are added to the wings for easier installation and locking power. 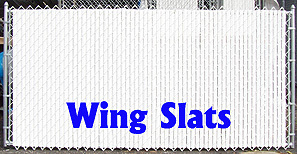 Wing Slats are sold in bundles enough to cover 10 linear feet in heights from 4' - 8' with the same color in each bundle. 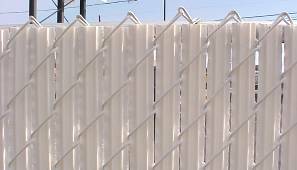 Aluminum privacy slats for chain link fences are made of 100% aluminum. Factory applied paint available in many different colors creates a resilient colorful surface. Colors can be alternated to create interesting and attractive diamond shaped patterns. Aluminum slats provide maximum privacy for your chain link fence. Imagine your backyard, private, safe and beautiful and you can do it yourself, just by adding privacy slats. Special spring tempered alloy, protected with a backed-on enamel finish, ensures you will enjoy easy maintenance free living. If rain doesn't keep it clean, the garden hose will. The sun won't fade the colors and the enamel won't chip, crack, or peel. Aluminum slates are sold in boxes that cover 20 linear feet in heights 3' - 10' with the same color in each box.